1.2 Million Passengers. One Single Track. California May Not Need That $68-Billion Bullet Train. But It Sure As Heck Needs More Rail Capacity. It would be useful research, too. California governments are still close to broke, but we are preparing to spend big money on one thing: connecting L.A. to San Francisco via high-speed rail through the San Joaquin Valley. Construction could begin in just a few months in the heart of the valley, and I realized I’d never traveled through that part of California by rail. 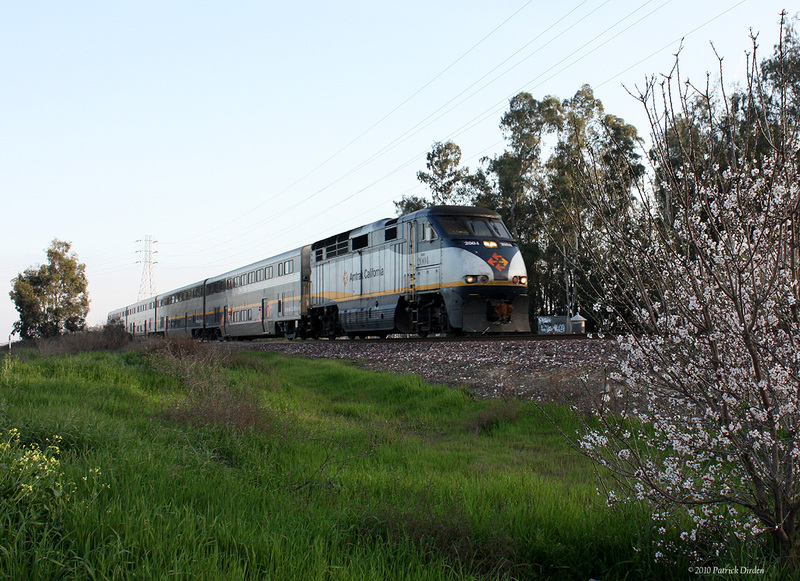 The Amtrak line in the Central Valley goes through some of the same communities that would be connected under the high-speed rail plan. So, on a recent Thursday morning, I found myself waiting on the platform of the train station next to Burbank Airport with a very excited 4-year-old. The noise there gives grownups headaches, but it’s paradise for kids who love machines. Ben cheered the Southwest Airlines planes that came in for landings, admired the Metrolink and Amtrak trains that stopped at the station, and called out the colors of the cars that sped by us on Empire Avenue. And then a bus pulled up to the train station and we boarded. Getting on a bus at an airport train station might seem like a strange way to begin a train trip, but if you want to go from anywhere in Southern California to the Central Valley by train, you have to take a bus to Bakersfield first. Only a single track goes through the Tehachapis, and it’s jammed with freight trains. Even if you could clear that track of freight trains, the speed limit of the winding route is just 25 miles per hour. This would be only the first of the gaps in rail infrastructure that Ben and I would experience during the trip. At least those Amtrak buses to Bakersfield are luxurious: big comfortable seats, clean bathrooms, and strong Wi-Fi. Our bus arrived early at the Bakersfield station, which is beautiful and immaculate, oddly Western European in look and feel (that’s meant as a compliment), with a fountain and rotating globe at the entrance. Bakersfield is the 60th largest city in the United States, but it has one of the country’s 25 busiest train stations. Amtrak buses—from Palm Springs and the Central Coast and Orange County and a dozen other places—steadily descend upon it so passengers can catch trains heading north. As the trip went on, we spoke to several of our fellow passengers, many of whom use this train to shuttle between their Central Valley homes and work in the East Bay. The Amtrak San Joaquins (longtime riders add that last “s,” so I do so here) is the fifth most popular line in the United States, and third in California after the Pacific Surfliner (the coastal Southern California route that includes L.A. to San Diego) and the Capitol Corridor (between Sacramento and the Bay Area). Its passenger numbers have been increasing in recent years, and now surpass 1.2 million annually. We spent most of the trip looking out the window, glimpsing the full wonder of the San Joaquin. The fruit and nut trees in perfect diagonal rows. Oil tank farms and oil train cars. Dairy sheds. Sloughs full of farm runoff. A Del Monte plant. A field of old military airplanes, somewhere between Turlock and Merced. Big piles of tires, plastic buckets, and wooden pallets. And soybeans, and corn, and lots and lots of cotton. Then, in Hanford, the train stopped abruptly for a minute, then five minutes, then 10. Ben got up and walked around the train, chatting with the conductor in the dining car, which has a menu as long as some delis. It would be the first of four unscheduled stops during the trip, none of which were the fault of folks at Amtrak California. The track—and there’s only a single track for stretches of the journey—belongs to the freight railroads, and their trains have priority. On the particular day we traveled, there was also a problem with a big switch between Hanford and Fresno. All the stops made the train an hour late by the time we arrived at Stockton. We could have reached Sacramento many hours later by train, but by bus the city was only an hour away, so we, along with dozens of riders, got off and boarded Amtrak buses. Our driver was in a sour mood; the train had been so late that he was going to miss the first half of the 49ers game. He sped us to the Sacramento train station 15 minutes faster than originally scheduled. Joe Mathews is California editor of Zócalo Public Square. Primary Editor: T.A. Frank. Secondary Editor: Becca MacLaren.